Super Bowl XLIX is being billed as a matchup between two of the best postseason quarterbacks in the business: the prolific Tom Brady and the cool Russell Wilson. But, just as the two Super Bowl starters are placed on a pedestal of playoff greatness, another name enters the discussion as an example of postseason ineptitude: Peyton Manning. After Manning’s Broncos fell to the Indianapolis Colts—his former team—in the divisional round, the Manning playoff haters came out in force. As we stand, the five-time MVP is 11-13 in his 16 professional seasons, with nine one-and-dones—an all-time NFL high. In this article, we’re going to delve into whether this performance is really under what we would expect of Manning, and if so, what might be causing the problem. On the surface, the story does not look good for Peyton. Though he has accumulated 11 wins (second most among active quarterbacks) his winning percentages lags behind the much less celebrated Joe Flacco, Mark Sanchez, and even his younger brother Eli, who is one more 9-win-turned-super-bowl-run season away from surpassing his older brother in postseason victories. But record, of course, doesn’t tell the whole story. An honest analysis would take into consideration Manning’s teams and his playoff opponents. This is especially important given Manning’s teams often get a bye, which immediately places them against stiffer competition. Using historical NFL point spreads, we can reasonably accurately estimate the probabilities of teams winning any given game. I use this table to convert each of the betting lines into a win probability for Manning’s teams, and then simulate his playoff career 10,000 times to see how often we get the 11-13 record he has today. We don’t need to adjust for home field advantage or seed, because the lines take care of that already. Across the 10,000 seasons, Manning’s teams averaged 15.17 wins (the red line), a solid four wins above the 11-win output (blue line) we’ve seen to date. 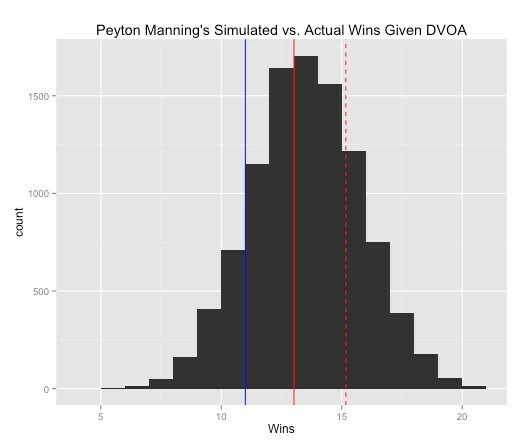 Only in 5.3% of the simulations did Manning’s teams achieve 11 wins or fewer, meaning reality fell just outside the 10% most extreme possible outcomes. Though this is not significant to the five or even ten percent level, it signals strongly that there might something going on with Peyton, and lends credence to the theories he’s a playoff choke artist. However, a deeper look should make us think twice about this conclusion. Though betting lines are accurate on average, their real purpose is to balance money on both sides of the bet, and so might be biased in this subsample of 24 games. In fact, we see some wonky lines from the past couple of years; should Denver really have been favored by 2.5 points in last year’s Super Bowl, a game that opened as a pick ‘em? Or did the 2007 Colts deserve to be spotted 11 against an 11-5 Chargers team that had handed Indy a loss in Lucas Oil Stadium, one of its only two losses that year? Or what about when the Colts were favored by 2.5 on the road against largely the same San Diego squad the very next year? In comparison, contrast Manning’s team’s betting lines to his and his opponents’ year-end DVOAs. A couple things stand out right away from this table. First, Manning’s teams are generally pretty good. Second, his opponents have been nearly as solid, with an average DVOA of 20.23. For reference, the 2014 AFC Champion Patriots had a 22.4 DVOA, and the 2013 New Orleans Saints clocked in at 19.3. In comparison, the average playoff team in the past five years has had a DVOA of just 14.9 (more or less the 2014 Dallas Cowboys). This discrepancy comes from the fact that Manning’s teams typically have byes and therefore are slated against tougher opponents. Second, there is some serious disagreement between DVOA and the betting lines. 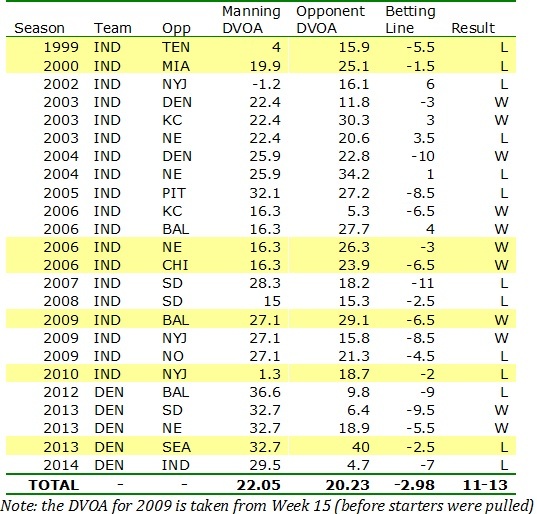 Manning’s teams have been favored by the lines 19 of the 24 times, but have had a higher DVOA just 12 times. I’ve highlighted the seven instances in which Manning’s teams have been favored despite having lower DVOA ratings. Three of the seven aren’t even close, like the 2006 Super Bowl team that came back against the Pats, and the surprisingly mediocre 2010 squad that flamed out against Mark “Playoff Road Warrior” Sanchez and the Jets. Those four don’t even tell the whole story, as the 2004 team received quite the line boosts in its two contests, likely fueled by Manning’s record-setting 49-touchdown campaign. No Manning team was ever an underdog by the lines when it was ranked higher in DVOA. DVOA paints a much more balanced picture than the spreads; Manning’s teams have been good, but so have his opponents. In this light, going 11-13 isn’t so bad—slightly underperforming, but not by much. For a little more accuracy, we can use these DVOA ratings to convert the difference in two teams’ DVOA to a win probability. 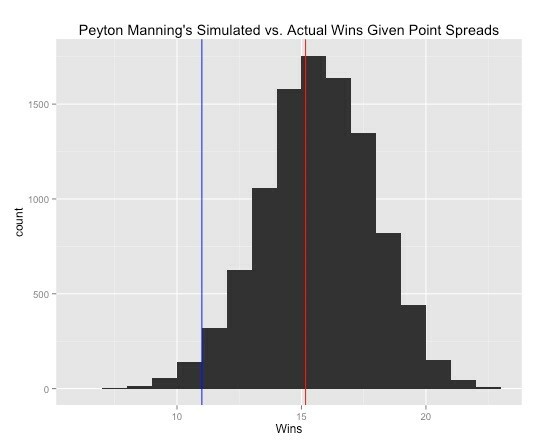 Re-simulating Manning’s playoff career with these probabilities, we find that his expected wins are 13.02 games, similar to the over-under Five-Thity-Eight found. This new red line is more than two wins short of the dotted line—the mean wins as simulated under point spreads. It’s also just two away from Manning’s actual win totals. Furthermore, 11 is now just in the bottom 24.9% of simulations, hardly significant by any means. Given his five MVP awards and hysterical TV persona, it’s natural for us to feel rotten about Manning’s underwhelming playoff performance. However, it’s likely that we’ve been placing enormous expectations on Manning that have proven too high even for him—his teams are not as good as we think they are, and it’s harder than we think to advance through three playoff games. Additionally, his consistently stellar regular seasons has matched his teams against stiffer playoff competition right away by skipping the first round. Finally, comparisons to guys like Joe Flacco, Eli Manning and Mark Sanchez are pure folly; it is statistically very likely to have mediocre players exceed expectations. Keep in mind that similarly (or exceedingly) talented signal callers Tony Romo, Andy Dalton and Cam Newton have just three playoff victories between them. I am glad someone recognizes this. Not to mention that if you go back and rewatch many significant Peyton manning playoff losses, you see the team around him chokes in significant ways. 2003 AFC championship- had poor protection, turnovers. Sure he threw two first half interceptions, but that could be attributed to the poor protection. Moreover, Tom Brady was nearly picked off but the would be interception was dropped. In the 2009 super bowl vs New Orleans, Pierre garçon dropped a wide open no brainier pass that could have changed that game. I would also point out that his drop in qb rating could be attributed in part to late game interceptions, where his team has already proven that they were not up to the task, and he had no choice but to try and force the win. If Peyton manning had played for the Patriots and tom Brady for the colts, Peyton would likely have 6 rings to Brady’s 0.